Chip SomodevillaRep. 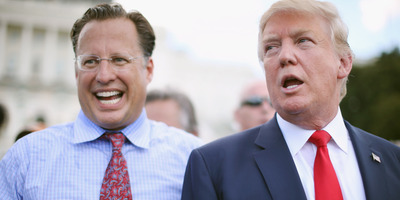 Dave Brat and President Donald Trump. Rep. Dave Brat, a Virginia Republican running for reelection, accused his Democratic opponent Abigail Spanberger of “shouting him down” with a “liberal mob” at a town hall. But a video that Brat is promoting of Spanberger shows her simply nodding her head and calling out responses to questions he asked of the audience at the gathering. In a new attack ad, Rep. Dave Brat, a Virginia Republican running for reelection, accused his Democratic opponent Abigail Spanberger of joining a “mob” in “shouting him down” at a town hall, even though Spanberger is shown simply nodding, shaking her head, and calling out responses to his questions in the video. On Tuesday, Brat tweeted out his new campaign ad, which includes footage of Spanberger, a former CIA officer, attending one of his town halls in which he invited the audience to answer a series of questions about taxation and government regulation. The ad singles out Spanberger, who is sitting in the front row nodding, shaking her head, clapping, and calling out answers along with the audience. Brat ends the town hall by asserting that he is trying to promote a discourse with his constituents. “Everybody asks for town halls so we can have a civil discourse, and so that’s what we’re trying to do,” he says. Democrats pushed back on the ad, accusing Republicans of characterising peaceful dissent as some kind of uncivil intimidation tactic. “This is what Republicans call a ‘mob’ and ‘shouting him down.’ Do not let them win this ridiculous reframing of citizens holding their elected officials accountable,” tweetedChristina Reynolds, a communications official at the Democratic PAC Emily’s List. Republicans were particularly critical of people – many of them women and sexual assault survivors – who demonstrated against Justice Brett Kavanaugh’s confirmation to the Supreme Court after multiple women accused him of sexual misconduct. “I’m glad those who tried to overturn the rule of law and replace it with mob rule lost,” Sen. Lindsey Graham, a South Carolina Republican, said on Fox News Sunday following Kavanaugh’s confirmation vote.